« CSI: prop trading investigation squad. Bartlett thinks this picture proves mean reversion. But it doesn’t. More importantly, he thinks that the authors of the paper with this figure claim this picture proves mean reversion. But they never actually take a stand. The paper doesn’t really test the proposition. In fact, the paper is careful not to take a stand, and never to clearly assert anything one way or another. 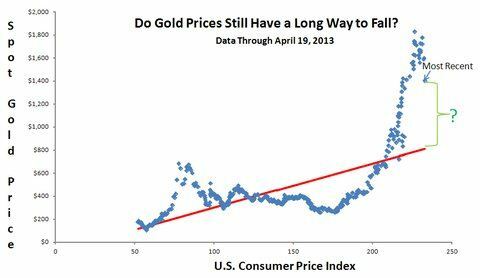 There is lots of statistical evidence that the gold price does not mean revert. In particular, there is lots of evidence from futures prices that there is no predictable reversion. Those people who want to claim otherwise have a minimal burden of proof to meet before we spend too much time listening. Maybe the gold price does mean revert. But show me some data with some real analysis. And be clear about what’s what in the analysis. Smooth talk is a waste of everyone’s time. This entry was written by John Parsons, posted on April 23, 2013 at 6:52 pm, filed under commodities, dynamic risks. Bookmark the permalink. Follow any comments here with the RSS feed for this post. Post a comment or leave a trackback: Trackback URL.